Fans aren’t at all happy with Fallout 76 despite the anticipation that built up around the game. Sales for the game must be bleak in Europe as some GameStop locations are offering the game at no cost, not with a console purchase, but with a used PS4 or Xbox One controller purchase. The copy of the game you get is brand new, not used. The deal is good at locations in Germany, Austria, and Switzerland. At launch, the game sold for €70. Fallout 76 is now selling for €30 as it has been slashed only months after launch. The cost of a new DualShock 4 controller is currently €53 brand new. Used controller pricing is expected to be less than that cost, even if only by a small amount. 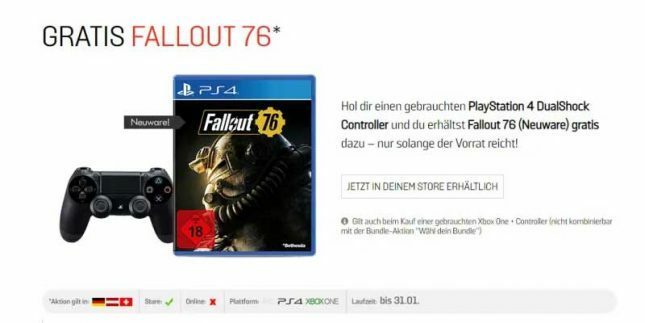 One electronics chain in Europe called Saturn has taken to giving a copy of Fallout 76 in physical form away with the purchase of the Fallout 76 Xbox One X bundle, which already includes a copy of the game in the box. Yes, you get two copies of the game reports Kotaku.